At the conclusion of the 2018 race season Daryn Pittman wasn’t sure what was going to happen in the future. The veteran Sprint Car driver’s tenure at Kasey Kahne Racing was coming to a close. Luckily, that wasn’t the end of the story for Pittman. The Owasso, Okla., driver was picked up weeks later as the next driver of the Roth Motorsports No. 83. Of all the driver changes in the off-season, so far Roth and Pittman have been by far the most successful. The tandem has yet to be off the podium in four nights of racing action at Volusia Speedway Park as part of the DIRTcar Nationals. Pittman finished third on opening night, second on Thursday before scoring back-to-back wins as he searches for another big gator at the conclusion of the racing action on Sunday as the DIRTcar Nationals Champion. 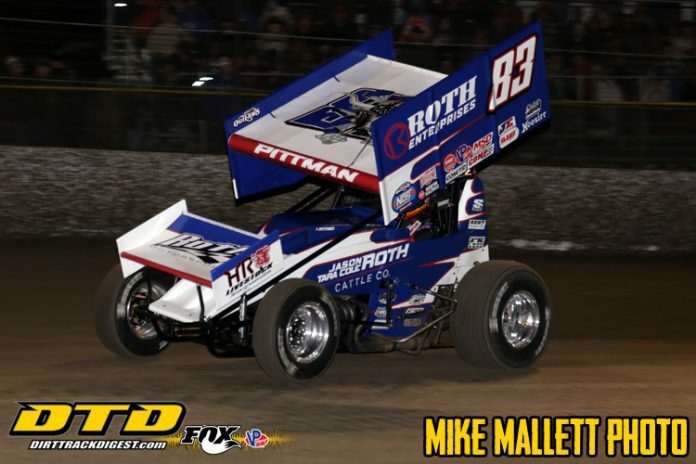 Pittman has now earned 83 career wins with the most prestigious Sprint Car organization in the country. It’s something that wasn’t lost on him after barely beating out 2019 Chili Bowl winner Christopher Bell in Saturday main-event. 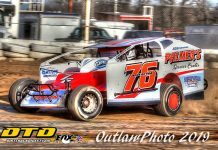 Sometimes in racing change is a good thing, and for Pittman moving to Roth has allowed him to have more say with his race cars. So far he feels like that is paying off as he and crew chief Brent Ventura have worked really well together to kick of the season. Those decisions so far have paid off as on Saturday night the battle with Bell was epic. Bell got out in front from his pole starting position to dominate the first half of the race. Pittman was steady riding in the top three before moving into second in traffic on lap 11. At that point he hung with Bell before passing him for the lead on lap 19. Bell went back by a lap later. Pittman went back to the top spot on lap 26, Bell regained on 27 before Pittman finished the job on lap 28 in turns one and two. Luckily for Pittman he was able to make it to the end without issue. In finale he’ll look to close out the title. He’s elated with how things have gone so far in Florida, but he’s not getting too excited about the start. Even though he’s been on fire in Florida, there is still nearly 90 races to go. Christopher Bell scored his second consecutive podium finish by coming home in second. Bell wasn’t sure after the 30-lap feature what he could have done better to beat out Pittman. He felt like he did everything right during the main. Although not a winner, Bell is happy to have the speed and the solid efforts at Volusia. It’s a place that hasn’t always been kind to him and wasn’t earlier in the week when he some motor issues. The team has righted the ship the last two nights. For the second consecutive night the A-Main ran caution free.